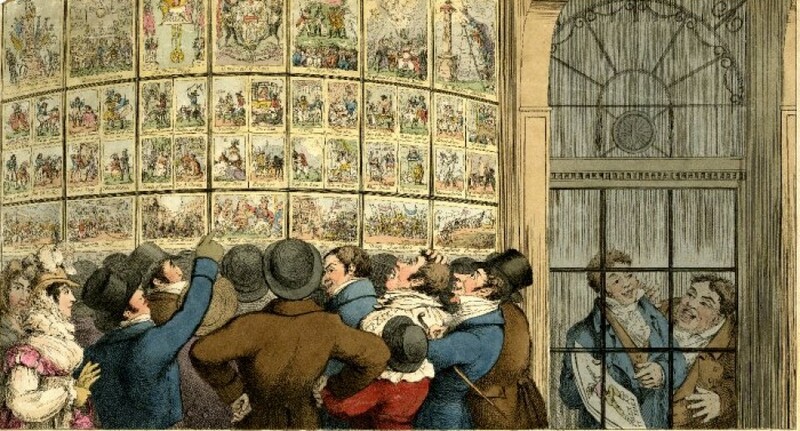 The Parable of the Prodigal Son was a recurrent theme in repertoire of the publishers of satirical prints during the third quarter of the eighteenth-century. This was a period in which the overt didacticism of Hogarth’s era was seemingly giving way to a more laissez-faire mood, in which the supposed excesses of the libertine were regarded as a source of wry amusement rather than an extensional threat to the moral health of the nation. 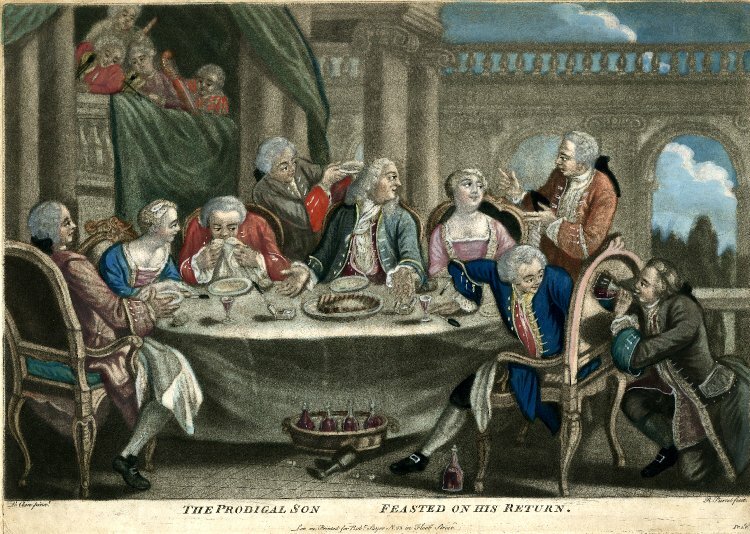 The popularity of the Prodigal Son as a theme for print-makers presumably owed something to the fact that the early plates in the series usually allowed customers to indulge themselves in scenes of rakish excess, safe in the knowledge that they were framed against the broader backdrop of a Christian morality tale and therefore remained within the bounds of contemporary notions of politeness. One only has to look at the two most famous examples of Prodigal Son prints from this period – published by Robert Sayer and Carington Bowles respectively – to note that the scenes of the wayward youth “Reveling with the Harlots” always seem to be rendered with far more enthusiasm than those of inevitable reconciliation that marks the son’s return to clean and sober living. 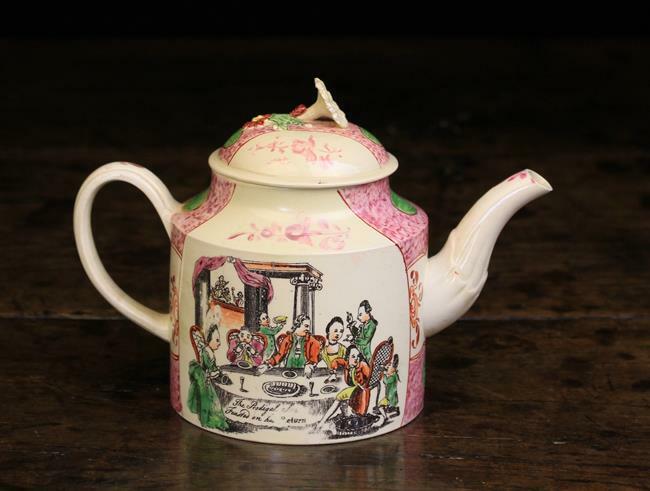 This Liverpool porcelain teapot indicates that the theme was popular enough to make the leap from print into other forms of material culture. It’s decorated with a transfer print adapted from Richard Purcell’s mezzotint’s after an original work by Sébastien Leclerc II which was published by Robert Sayer c.1765. The original print is one from a series of six engravings that tell the complete story of the Prodigal Son. As usual with pottery transfer printing, the design has been altered significantly to reflect the size and shape of the vessel and the comparatively limited skills of the engraver (who may have been a potter rather than trained draughtsman). I’ve provided an image of the original engraving from the British Museum collection below for comparison.